You are here: Home › The Best Microphone For Self-Recorded On-Camera Auditions? Self taping auditions – you can do it with an iPhone, or with a nice Canon EOS Digital Rebel, but the sound is not as good as the picture. Is there a good plug in mic? Can you use the wonderful AT2020 USB Plus? Where does one put the plug? Any thoughts, suggestions, words of wisdom? Maybe a 60 second rant? Thank you so much for all your great advice and classes and your intelligent, sane approach to life and the business. I know it’s a bit off-topic from pure VO, but this question is one I hear a lot (and is one of the reasons I created my on-camera presence class, Camera Ready U), and it’s especially relevant to most of my clients and students, as they also have an on-camera acting life as well. RUNNING AN AD BLOCKER WITH YOUR BROWSER? That means you won’t see the images of any of the items I’m recommending below, as most ad blockers hide links to Amazon. Sad face. You can either turn your ad blocker off temporarily, or you can use the links that will appear in boxes like this – they both go to the same place on Amazon. THE AT-2020 USB/USB PLUS: I wouldn’t recommend it, but if that’s your only option, you can use the AT-2020 USB for self-taped auditions, and I’ll show you how to do this as the first of three options. But…the problem is that the AT-2020 works best when “played” close, a few inches away at most from your mouth. That would mean having a pretty big honking mic in the shot, and would limit your movement. Since you don’t usually want the mic in the shot, and it would have to be to play it close, I have some other options for you further down. And yes, if you don’t want to buy yet another mic, you can make your camera shot close enough to hide the AT-2020 just off camera, and it will do an OK job of picking up your voice as you move around in the scene. Play with various angles to get the best results, but note that there will be additional room noise the further away from the AT-2020 you get. And…if you must employ the AT-2020 USB, you’ll need an adapter that will allow you to plug it into your iPhone or iPad. Depending upon the iPhone (4s and up only) or iPad model, you choose either the Apple Camera Connection Kit, or the Apple USB to Lightning Adapter. You plug the AT2020 USB Plus into the appropriate adapter, which then plugs into the charging/sync port of the iPhone or iPad. NO IMAGE? Use this link instead. But there are a couple of much better options if you have the budget for it, and having these as your go-to mics for self-recorded auditions means you don’t have to constantly unplug and plug your AT-2020 in and out of your VO setup. 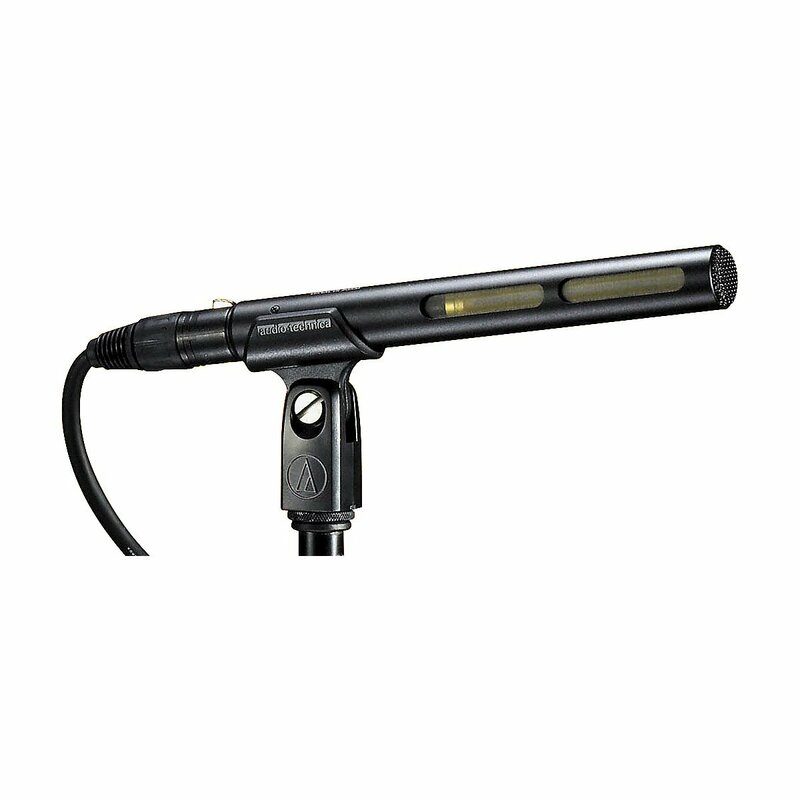 If you’re going to be moving around, this mic will be best for picking up your voice consistently. Remember to position the mic under your shirt, and on the side that you’ll be facing when you address the camera, and watch for clothing noise if you’re making large moves. BEST: THE ATR-6550: But the best mic I’ve found for this is another mic in the Audio Technica line, and it’s my third option. NO IMAGES? Use this link for the mic, and this link for the adapter cable. I’m well aware that the last couple of options will cost you more money than you’ve already spent on your AT-2020. But it’s one of the best investments in your career that you can make – a tool that allows you to create great audio, as well as great video for your self-recordings. And that’s where the world is headed – more and more on-camera jobs are being landed by smart actors and VO talent who audition from home. I’ve set up an entire space in my condo to self tape auditions, in addition to my VO studio, using this shotgun mic. 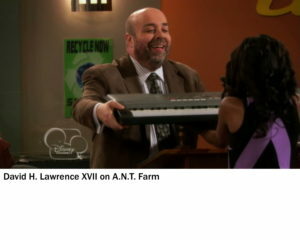 And that appearance I made on Disney’s A.N.T Farm awhile back? That audition was taped on my iPhone in a hotel room in Boston. I’m living proof that self-recorded auditions, recorded on an iPhone, can land you high paying acting and VO gigs. 12 Responses to The Best Microphone For Self-Recorded On-Camera Auditions? Thanks David. What a great answer to all the questions I didn’t know I had. You really are a guru. Thanks Deborah for asking. Thank you for the resource info and links. If I’m reading these correctly, you are still bound by a cord (from mic to “camera/recorder”). Can you recommend a wireless solution? Almost any wireless solution will be a lot more expensive, and are usually in the lavalier class. Audio Technica has several lav solutions that will work. I will say that for on-camera auditions, wireless may not give you any advantage that would be worth the cost difference, and adding a layer of complexity that may send you screaming back to a wired solution. I’m not necessarily disagreeing with David, but I will say that IF you are an independent filmmaker in addition to being an actor, you SHOULD go with the more expensive wireless setup if you can afford it. This is because you can add it to your audio equipment to be used on set by the actors in your films. Also, if you have an iPhone, you can use it to record your dialogue… just plug in the wired lav mic and put the phone in your pocket… use another camera for the video and sync in post. But if you don’t produce your own films, then don’t add the extra cost because you’re not going to be that mobile anyway for a self-taped audition. Hi everyone. I’m enjoying the posts and comments. What about a shotgun mic pointing down at the talent and mounted on an overhead boom arm just above the camera frame? 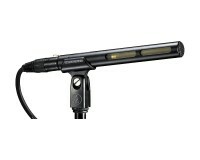 Sweetwater has several mics in all different price ranges, and they sell booms too. And they are so nice! Tell them what you want to do and how much you want to spend and they will fix you right up. That’s exactly what you’d do with the mic I suggest in the article. And both Amazon and Sweetwater have good prices on the AT 6550. Fixed. Ad blockers prevent the images from being seen. How is a shotgun mic any better for auditioning than using the phone’s built-in mic? Isn’t a shotgun mic very directional? If you move off center when you’re auditioning then the mic won’t pick you up very well unless the camera/mic moves with you. If you’re going to stay still in the audition, the built-in mic will pick you up just fine in a relatively close-up shot, which is what you should be shooting anyway. It’s an audition, not a production. They want to see and hear your acting, not enjoy a film. It’s the same logic for David doing voice over auditioning on an iPhone in a Boston hotel room being adequate. It’s actually a lot better than the built-in mic. A shotgun is directional, but not THAT directional. You’d have to move off camera for it to not pick up your audio. And a shotgun does a much better job of rejecting room noise than does a built-in mic. The audition you’re speaking of was actually an on-camera audition, for which I had no lav or shotgun, and had to use the built in mic (as I said, in a pinch, it’s fine – but a shotgun or lav is better). ow does the lav do with a laptop? I usually use my laptop to record. I had no problems with my old mac, but now with my lenovo, i have issues hearing my reader, behind the camera. Does the lav pick up the reader’s voice too? As with your Mac, any mic will pick up your read, but from a distance (and should sound in the background). There wouldn’t be any marked difference between computers, if you’re using the same mic, plugged in to the same type of input. The mic’s sensitivity wouldn’t change because you changed computers.